a friend of a friend of a friend worked for either rick or the band or both in the late 70s. when he heard i was a yes fan going to this show, he said, "what do you say we go down to the spectrum the day of and snoop around? there may be some crew i know that will let us in." we went and there was one guy left he knew - alan's roadie at the time, nu nu (he knew nu nu?). the next thing you know, we're helping roll the stage into place! the next thing you know, we're climbing through the scaffolding under the stage! the next thing you know, we're headed up a ladder that puts you onstage right behind alan's drums! the next thing you know, we're trying to understand nu nu through a thick accent!!! the next thing you know, i'm going to everyone's position and staring out at an enormous, empty, maroon, humming arena, pretending to belong there! all of this with no laminate! this is what you had to do in 1988 to get a preview of the setlist! there were setlists onstage, and yeah, i snuck a peek. we left a few minutes later. i don't remember if we were asked to leave, or if it was voluntarily, not wanting to overstay our welcome. our seats for the concert (my third yesshow) were seemingly great; first row of the first level, directly across from the stage. only problem was, when the show started, everyone on the floor stood on their chairs, obscuring trevor, jon, and chris! we screamed and screamed at the inconsiderate tippy-toers, begged the outnumbered, shoulder-shrugging ushers to do something, but... nothing. oh well, no matter. for a few minutes that afternoon, i had the best seat in any house ever. 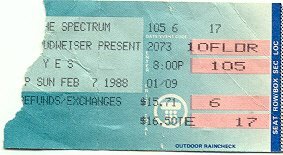 Not only was this my first Yes concert but this was my first concert ever. I was only 5 years old at the time (almost 6), however Yes' music was very familiar with me. My brother and I got into music at a very young age, and Yes was there from the beginnig. I went with my parents and my brother (who was 8 at the time). I can remember people being very suprised when my parents would tell them that my brother and I were the reason that they were at the show (my dad saw Yes about three times in the 70's but wasn't really too keen on their 80's work). Since I was so young I can only remember a few things: it was very loud, there was a twinkling light shining in my face at the beginning of "Changes", and I actually fell asleep at some point which astounds me to this day. Not that the show was boring or anything, but it was much passed my bedtime, haha. When I did wake up it was during "Wurm", which I enjoyed especially on the 9012live video (wore out that tape, we never bothered with Sesame Street or Muppet videos). So that was a treat. And thanks to this site, I can prove my brother wrong on something. I had a very faint memory of them playing "Heart of the Sunrise". He swore they didn't, and when I showed him this site, he was busted :). I have seen Yes seven other times since. And although my memories of this one are hazy, it was one heck of a first concert. Yes had swung back around to Philly before on other tours(Do you think they like us here?) and I hadn't gone since I figured it would be the same show more or less and I had to be frugal since my funds were sadly limited in those days. I'd already seen them in late November on the first leg of this tour and they were back surprisingly quick this time(9 weeks!) I was so impressed with that show, however, that I had to go back again! This time I would treat my friend, Larry, for his birthday. The show was even BETTER this time around. At the November show they'd opened with Almost Like Love. I liked that song but thought it was an odd choice for opener. Rhythm Of Love seemed more suitable and I was surprised it hadn't been performed at that show. The band must've been in line with my thinking because they placed that song as the opening number for this leg of the tour(It had also become the 2nd hit single from BG by this time!). I was also happy to see Big Generator still in the set. That was one of the numbers they later admitted was underrehearsed due to time limitations(I'm Running and Final Eyes were dropped after the 1st few shows on the tour for the same reason). I could tell, since the bass and guitar were out of tune on the chorus of that song at the November show. It sounded better tonight, but when I later listened back to an audience tape of the same show I could tell they were still having difficulty staying in tune on that chorus. Tough song to do! I also remember the guys having to stop again(like they had in November!) after Heart Of The Sunrise to wait for the applause, and standing ovation we gave them, to die down. Larry was totally blown away by his first Yes experience!